Series 4000 gas generator sets built by MTU Onsite Energy, a Rolls-Royce Power Systems subsidiary, have been certified as compliant with the medium-voltage directive issued by the BDEW (Federal Association of the Energy and Water Industry) in Germany. Operators of MTU Onsite Energy gas gensets are therefore authorized to feed the power they produce into the public grid. This is set out in the fourth amendment of the ‘Technical Guideline for Generating Plants Connected to the Medium-voltage Grid’. Moeller Operating Engineering is the responsible certifying body and has awarded MTU Onsite Energy the certificate for its gensets based on Series 4000 gas engines with power outputs from 750 to 2600 kilowatts. 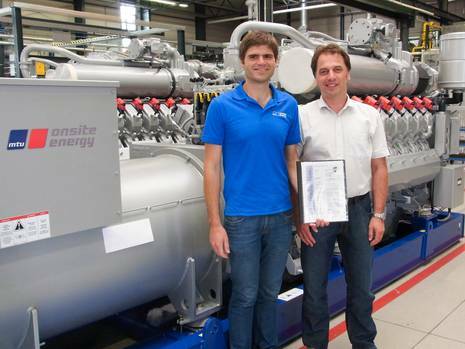 “Being armed with this certificate puts us in a very strong position on the market for gas gensets,” explained Jörg Mielke, head of sales in Germany at MTU Onsite Energy. To satisfy the new technical requirements, extensive modifications were needed to the design of the gensets as well as to their protection and control technology. In the last few years, distributed power generation has expanded significantly following Germany's Renewable Energy Act, and the Combined Heat and Power Act. Public utility companies, industry and agriculture are increasingly opting for power generation on site. As a result, the number of big power stations on the public grid that provide the system services needed for grid stability is continually decreasing. Above all, energy from sources such as wind and photovoltaics that is difficult to regulate and sometimes generated at a long distance from consumers is making network stability a particular problem for grid operators. The certificates which have been awarded to MTU Onsite Energy confirm that its CHP and biogas plants will contribute in future to the system services needed for the public grid. That includes static grid support by, for example, the supply of reactive power or automatic reduction of output in the event of grid frequency increases. Dynamic grid support is also provided in the form of fault ride-through with contribution of the corresponding short-circuit currents. This is the way in which CHP plants and biogas plants from MTU Onsite Energy will be helping to secure the future success of the energy turnaround.